Everything visible on your screen is visible because it was painted by a brush. For example, a brush is used to describe the background of a button, the foreground of text, and the fill of a shape. This topic introduces the concepts of painting with Windows Presentation Foundation (WPF) brushes and provides examples. Brushes enable you to paint user interface (UI) objects with anything from simple, solid colors to complex sets of patterns and images. A Brush "paints" an area with its output. Different brushes have different types of output. Some brushes paint an area with a solid color, others with a gradient, pattern, image, or drawing. The following illustration shows examples of each of the different Brush types. Most visual objects enable you to specify how they are painted. The following table lists some common objects and properties with which you can use a Brush. The following sections describe the different Brush types and provide an example of each. A SolidColorBrush paints an area with a solid Color. There are a variety of ways to specify the Color of a SolidColorBrush: for example, you can specify its alpha, red, blue, and green channels or use one of the predefined color provided by the Colors class. The following example uses a SolidColorBrush to paint the Fill of a Rectangle. The following illustration shows the painted rectangle. For more information about the SolidColorBrush class, see Painting with Solid Colors and Gradients Overview. A LinearGradientBrush paints an area with a linear gradient. A linear gradient blends two or more colors across a line, the gradient axis. You use GradientStop objects to specify the colors in the gradient and their positions. The following example uses a LinearGradientBrush to paint the Fill of a Rectangle. The following illustration shows the painted rectangle. For more information about the LinearGradientBrush class, see Painting with Solid Colors and Gradients Overview. 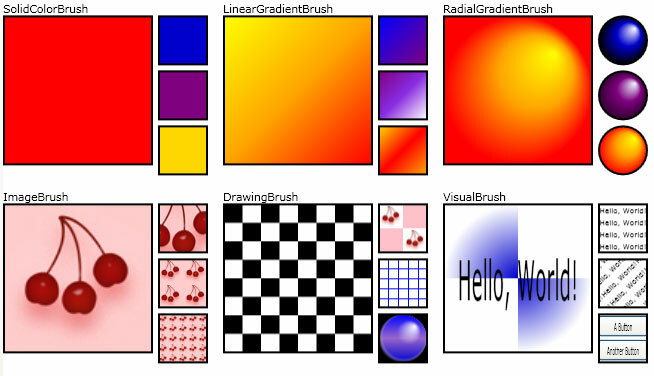 A RadialGradientBrush paints an area with a radial gradient. A radial gradient blends two or more colors across a circle. As with the LinearGradientBrush class, you use GradientStop objects to specify the colors in the gradient and their positions. The following example uses a RadialGradientBrush to paint the Fill of a Rectangle. The following illustration shows the painted rectangle. For more information about the RadialGradientBrush class, see Painting with Solid Colors and Gradients Overview. An ImageBrush paints an area with a ImageSource. The following example uses an ImageBrush to paint the Fill of a Rectangle. The following illustration shows the painted rectangle. For more information about the ImageBrush class, see Painting with Images, Drawings, and Visuals. A DrawingBrush paints an area with a Drawing. A Drawing can contain shapes, images, text, and media. The following example uses a DrawingBrush to paint the Fill of a Rectangle. The following illustration shows the painted rectangle. For more information about the DrawingBrush class, see Painting with Images, Drawings, and Visuals. A VisualBrush paints an area with a Visual object. Examples of Visual objects include Button, Page, and MediaElement. A VisualBrush also enables you to project content from one portion of your application into another area; it's very useful for creating reflection effects and magnifying portions of the screen. The following example uses a VisualBrush to paint the Fill of a Rectangle. The following illustration shows the painted rectangle. // to paint the rectangle. // Create the brush's contents. For more information about the VisualBrush class, see Painting with Images, Drawings, and Visuals. For convenience, Windows Presentation Foundation (WPF) provides a set of predefined and system brushes that you can use to paint objects. For a list of available predefined brushes, see the Brushes class. For an example showing how to use a predefined brush, see Paint an Area with a Solid Color. For a list of available system brushes, see the SystemColors class. For an example, see Paint an Area with a System Brush. Brush objects provide an Opacity property that can be used to make a brush transparent or partially transparent. An Opacity value of 0 makes a brush completely transparent, while an Opacity value of 1 makes a brush completely opaque. The following example uses the Opacity property to make a SolidColorBrush 25 percent opaque. If the brush contains colors that are partially transparent, the opacity value of the color is combined through multiplication with the opacity value of the brush. For example, if a brush has an opacity value of 0.5 and a color used in the brush also has an opacity value of 0.5, the output color has an opacity value of 0.25. It's more efficient to change the opacity value of a brush than it is to change the opacity of an entire element using its UIElement.Opacity property. You can rotate, scale, skew, and translate a brush's content by using its Transform or RelativeTransform properties. For more information, see Brush Transformation Overview. Because they are Animatable objects, Brush objects can be animated. For more information, see Animation Overview. Because it inherits from the Freezable class, the Brush class provides several special features: Brush objects can be declared as resources, shared among multiple objects, and cloned. In addition, all the Brush types except VisualBrush can be made read-only to improve performance and made thread-safe. For more information about the different features provided by Freezable objects, see Freezable Objects Overview. For more information on why VisualBrush objects cannot be frozen, see the VisualBrush type page.